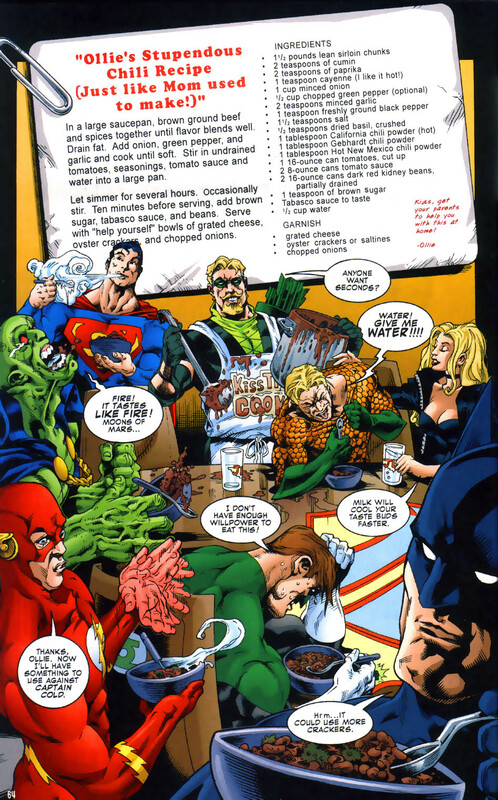 To me, it’s always been a weird character point that the Green Arrow was a chili aficionado. I don’t know why, but it always struck me as odd. So how exactly does he go about making it? After years of being mentioned, his recipe was finally featured in 2002’s Green Arrow Secret Files & Origins #1. I’ve actually made it. While it’s darn tasty, its freaking hot. How hot is it? So hot that its a running joke that the only people who enjoy it are Green Arrow (because its his recipe) and Batman (because he’s crazy tough). This leaves me with the question of who on the DC staff at the time actually came up with this recipe? This entry was posted in Uncategorized and tagged batman, chili, dc, green arrow, recipe by Chris. Bookmark the permalink.